"I work on the Web...I'm all about taking advantage of technology to improve teaching and learning." Anita lives about a 20 minute drive from York University. 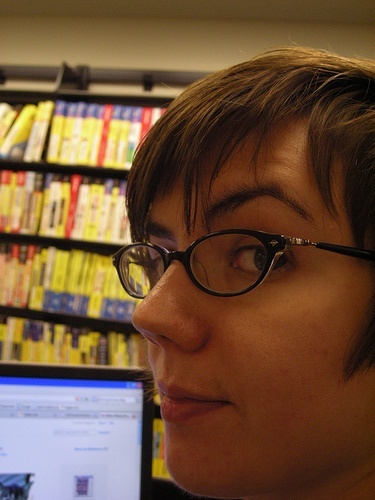 She earned a master's degree in Library Science with a specialization in Library Technology Management 8 years ago. She considers herself fairly tech-savvy and loves hand-coding in HTML. She loves to use her Nikon D90 to take photos of all the adventure sports she participates in with her husband. She's also addicted to Flickr - one of her favorite pastime is to browse through other people's Flickr photos and upload her own photos. While working at a public library as an assistant through her undergrad years, Anita was exposed to web technology as well as educated women who weren't afraid of exploring it. She started teaching online about 7 years ago. She now is an Instructional Designer for all online courses for the Professional Learning Centre and the continuing education courses for librarians. Anita works together with the instructors on the high level course plans. The instructor writes the contents, and Anita organizes and puts them online. She is usually very busy setting up course sites on Blackboard in the beginning of each term. She meets with the instructors frequently to get their contents in a variety of formats including text, audio, and video. During the term, Anita monitors, moderates, and manages the sites. She answers any questions the students have and acts as technical support. She monitors the discussion forums in particular and deals with students' technical issues. Occasionally there are days where she gets no emails from the students. She likes those days where she can focus on more interesting things, such as looking through research papers. Anita send out emails every week through BlackBoard to notify the students of changes in lecture schedules, give them feedback on assignments, remind them about upcoming assignments, etc. She hopes to do this as an audio podcast in the future. She posts announcements on Blackboard in the Announcements section using WYSIWYG text format editor. She is not very fond of this because it's very slow, but she does like the timed release and expiry control. Anita is proud to report that the assignment quality is generally much better with the online courses she is supporting than with non-online courses, and she attributes this to the weekly postings the students are required to do, "it's a good practice writing about current issues!" Post course content to LMS: Anita edits the course content created by the instructor with the instructor's help to make it more "ready for the web." She then posts it to Blackboard by herself. Monitor student activity in LMS: Students are required to post to the discussion forum every week, and Anita monitors this and their activity in general. On the Performance Dashboard she can see an individual students' last login, discussion board posts, and scores on surveys/quizzes. She red flags struggling students, or those who don't log in for a few days, so the professor can send an email to see what is going on. Help students with technical issues with the LMS: Anita receives emails from students who are having problems with the LMS and tries to help them solve them. They come to her with issues such as "can't see the message board," "can't see the videos," "my postings are not showing up," etc. These issues typically happen around assignment due dates, and she generally responds to them via email, though occasionally an in-person consultation is required.